OK, so here I am being bold, even audacious! What in the world is a Merkaba? I first encountered the Merkaba as a focal object for meditation at Rosemary’s seminary 20 years ago. At that time I could visualize it but it didn’t call to me. I was recently reminded of the Merkaba when I read Drunvalo Melchizedek’s latest book: The Mayan Ouroboros. The Merkaba is mentioned briefly, almost in passing, but it struck a chord with me me this time. So, I looked more deeply into this geometric form that some say holds the shape of the Human Lightbody. I’ve pictured it here but it is difficult to capture the dynamics of the crystalline model. In essence the Merkaba is a pair of interlocked and spinning tetrahedrons. That part of this picture is more or less how I visualize this object within me. As I “see” it the lower tetrahedron spins counter-clockwise and the upper clockwise. There is incredible speed involved; some say they spin at the speed of light. There is tremendous energy with beams shooting below and above the pyramids. While I was holding the Buddhic Column, the Merkaba became prominent in my meditation. I seemed to merge with the Buddhic Column; I was no longer holding it but standing within it. It seemed to have expanded to engulf me. I felt light, lifted and I could both feel and see the light all around me. 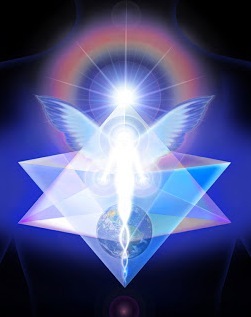 As the Merkaba spun I seemed to drill myself – my energy core – right down into the Earth. I felt her pain. I sent healing energy through my core. It was like I was an energy rod bringing light from above down into the heart of Mother Earth. The continuing trend was this downward spiral. There was a gravitational pull on me that felt more like a loving embrace than anything of a grabbing or greedy nature. Toward the end of my meditation I was also lifted upward. The Sun’s gravity lifted me; I felt taller and my arms, still holding on to a part of the column, were lifted. This felt like a freeing force and my arms flew upward in a gesture of surrender and release. And I popped out of my meditation. The Merkaba spun on, a constant light energy that animates. But my conscious awareness of it slipped to the background, merging with my unconscious, but only just beneath the surface. I have a sense I can call up to consciousness this energy pattern anytime I need to emphasize my lightbody in the physical plane. There is a magic power here that I need to protect and also practice for the good of all. Well, there you have it. Audacious, right? How are you being audacious in your transformation? This is the year, this is the time! We are all Lightbodies, called to be Light-Workers!